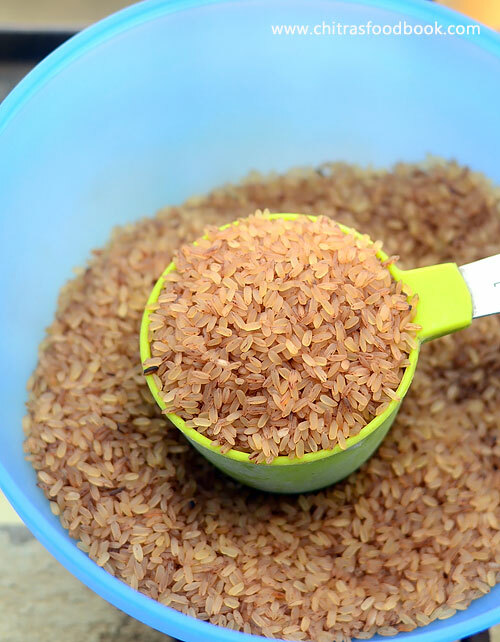 We all know Red rice has amazing health benefits when compared with our usual white rice.So i always think to include it in my regular diet. Last week I made this healthy red rice(Kerala Rosematta) idli recipe for the first time. 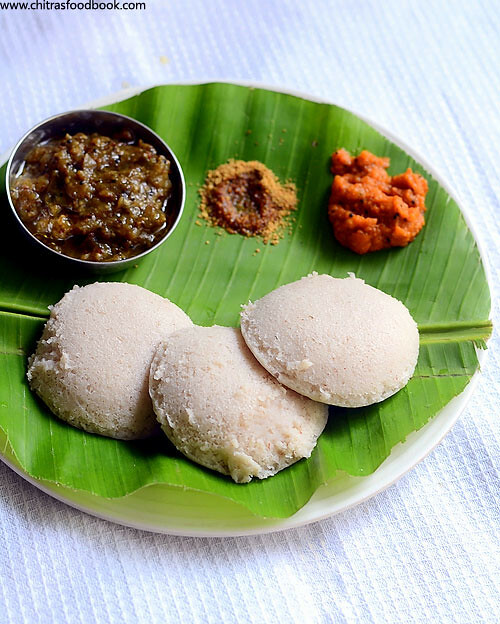 I have tried varieties of idli recipes using millets,brown rice,oats and even with barley. When I saw 1/2 kg of Kerala red rice in my pantry which I bought for my Onam sadya, red rice idli & dosa flashed in my mind.I browsed through many recipes and watched some youtube video recipes too.Finally i came up with this version. Idli came out super soft and dosa was very flavorful except the color was dull white.I was very happy with the result and including this in my Idli varieties collection.Sorry,I am not able to post this recipe with stepwise pictures as they got deleted by mistake.Please find the picture of red rice I used in this recipe. 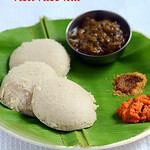 Lets see how to make this healthy, soft idli recipe using Kerala Red rice . Wash and soak Red rice + Idli rice + poha together for 2-3 hours.Wash & soak urad dal + Methi seeds for 2 hours. Grind the soaked urad dal first adding water little by little in regular intervals.I used nearly 1 to 1.25 cups of water. Make a smooth,fluffy batter.Remove in a bowl. Grind the rice to a smooth paste adding required salt & water.Remove the batter and mix with urad dal batter.Use your hands and mix it well. Allow the batter to ferment for 15 hours or overnight. The next day morning,batter would have raised a bit with sour smell.Batter din’t double for me.Mix the batter well and make idlis.Heat idli pot with water.Grease the idli plate with little oil and pour the batter.Steam the idlis for 10 to 15 minutes till the back of spoon comes out clean. 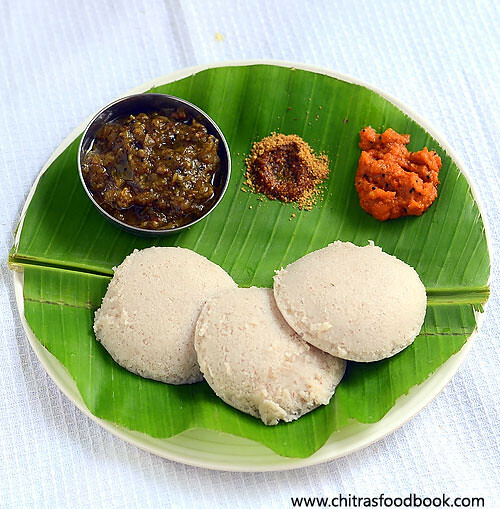 Remove the idlis and serve hot with chutney & sambar. For making dosa,mix the batter well.Add little water if its very thick.Heat dosa pan,pour a ladleful of batter and spread it thin.Drizzle a tsp of oil around the dosa.Cook both the sides and remove.Enjoy ! I served it with Chidambaram kathirikai gothsu and tomato chutney. Here i have used 5:1 ratio of rice & dal.You can use 4:1 if you use red rice alone. I used a small portion of white rice just for the taste.You can skip it if you wish. 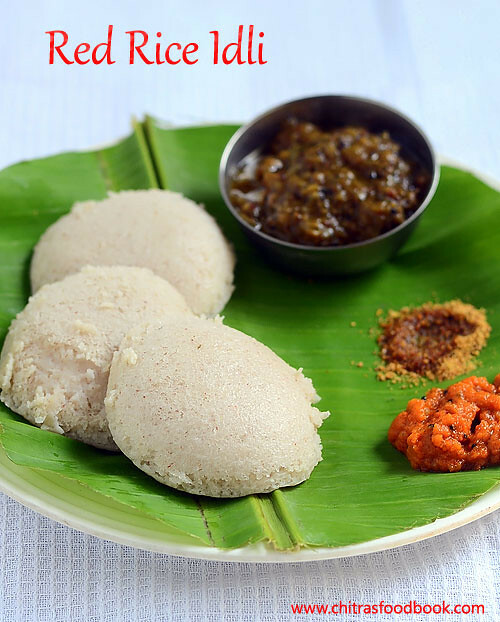 Enjoy this healthy,super soft red rice idli recipe for your breakfast & dinner !! idli looks so soft!perfect platter! Wonderful recipe! A true flavor of Traditional Indian Recipe. Madam, have u written any book on this. please let me know & where it is avaialable. Hi, I want to know what is red rice n matta rice. Which red rice has to be used. Dark or pinkish one.